Slipping in and out of the shadows, from barely visible to invisible, he became the specter of danger. Nonchalant as he approached, without moving a whisker the menace of his presence could be felt. Though he was not yet in full hunting posture as he assessed my intent, the threat was tangible. Capturing this encounter with layer upon layer of pen strokes gave me time to relive and revel in the moment. Even the thousands of dots creating the nightfall behind the leopard became a reward of their own as his eyes began to glow with life. Sherry Steele uses animals to portray the emotions that create the storm of the human condition. 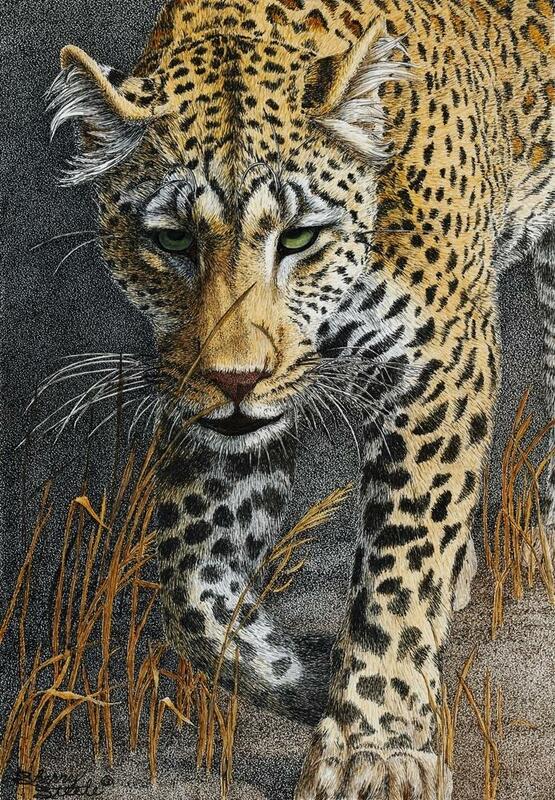 She brings a unique style to the field of wildlife artistry with her signature technique using permanent inks.